Public Speaking Anxiety: Six Modalities to Help Deal With It. How Can Public Speaking Anxiety Be Managed? Can Public Speaking Anxiety affect any speaker at any point in their career? The answer is a resounding yes. Don’t let this thought stress you out. There are a number of healthy ways to deal with it. Please note: if you have public speaking anxiety or fear of public speaking, there are numerous web sites and resources that can help you with this problem. However this section is probably not the place to help you. This is for accomplished speakers who may experience this for a number of reasons. This section also looks at some public speaking health concerns. There are numerous suggestions, recommendations, and resources for people with public speaking anxiety. Some are novel, basic, common, or even tasty, and very effective. Others are very dangerous. We will review both to various degrees. I have seen numerous posts in forums and even other speakers will ask about this medicine or that herb that they heard will help them speak better and deal with the public speaking anxiety they feel. Why should you believe me when I discourage their use? Because there is a simple, effective and almost free way to reduce anxiety that is probably in your cupboard. More importantly, it is safe for most people if you are in reasonably good health, your kidneys and liver work, you do not have heart failure and not under medical care. Unless it is natural and something we would normally eat, I stay away from such. There are exceptions but when it comes to brain things, extreme caution needs to be exercised. While the supplement may be reasonably safe, it may have an adverse reaction with something else you eat and cause even worse problems than the benefit you looked to overcome. I have to tell them a story about a patient I had one Saturday. She was visiting form out of state. She had some health problems. A well meaning friend told her how to treat the problem using a well known home remedy that is always effective. Although unrelated to treating anxiety, there is a lesson to be learned here. If you choose to use natural treatments, try them out first at home and only try them if you research them and know what your getting yourself into. What this hospital patient was told was actually true. The treatment was effective. It was so effective, unfortunately, in her case, it nearly killed her. She ended up in a teaching hospital, on my floor, under my nursing care, needing emergency surgery. I can probably imagine the verbal exchange at home. My patient, "I have this health problem for the past few days." Friend,"I have just the thing for you." Patient, "I don’t know, this doesn’t feel right. I should see the doctor when I get home." Unfortunately, it wasn't OK. It nearly killed her. So before you take some home remedy or some medicine not prescribed by your doctor, be aware it could have some very bad side effects like disability or even death. That being said, there are natural ways to decrease anxiety. The one we like best is almost free. It is called the Water Cures Protocol. 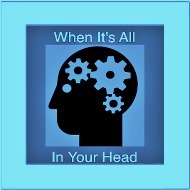 Click on the All in Your Head Box to learn more about it. Let me say here, you don’t know what public speaking anxiety is until you speak in front of a large group of doctors. It is magnified when it is a teaching hospital. Sometimes it seems like it is sport to challenge some aspect of what you say at the end of your speech. There is a simple remedy for the stress we all use when faced with this. It's called preparation. It is a sure cure and a way to overcome public speaking anxiety. You can bomb or be the bomb. Back to what goes on inside hospitals and why you should believe me. Most people don’t know much about hospitals or what goes on there. There are a lot of assumptions and propaganda. Some things are correct, the vast majority is unknown however. One of those things you don’t know about is that we use a number of holistic treatments in the care of the patients. Almost every patient there is given vitamins and minerals. We give additional injections of vitamins for combating stress and anxiety. We give certain foods rich in vitamins and minerals that directly help the healing process. There are numerous methods of treating stress. What's your candy of choice, really, I mean candy? Some patients may have a doctors order to chew gum post operative. Yes, chew gum. Another may have an order for Black Strap Molasses and peanut butter. This to help build their blood up and avoid blood transfusions (usually for cancer patients who have lost a lot of blood and to avoid the dangers of blood transfusions). These are not recommended for overcoming public speaking anxiety. They are to demonstrate holistic health care. Just like holistic health care, holistic public speaking addresses the sum total of you. Holistic means your spirit, mind, body and heart. I have even seen doctors kindly prescribe 12 to 16 oz of ETOH in nursing homes. It was prescribed to be taken orally and could only be used between certain hours. The patient had a problem with fluid regulation that this one medicine seemed to take care of. Not only that, the patient was very happy to get his prescribed medicine, usually at 5pm every evening. In the case of this patient, it was also an effective stress reducer. The only problem was we couldn’t fill the prescription from the pharmacy. And the prescription was very specific, it could not be generic. Only Budweiser (chemical name ETOH) from the local beer distributor would fill the order. Further, consider one of my hospital employers has an in-house acupuncturist. At a different employer they did a clinical trial of an all herbal allergy med. We even have cancer patients come through being treated with traditional medicine, apothecary, and both. Currently the outcomes are about the same for both modalities, around the 80-82% success rate. We know which work if the promoters are willing to allow scientific studies. The point is, the medical field is more open minded than most realize. When it comes to stress management, don't play doctor. What vitamin companies don't want you to know. So when you see those… "What doctors don't want you to know." ad's the spam filters inside your head should come on. In reality, the supplement and vitamin industry don’t want you to know that doctors do indeed know about theses things. In addition to their curative affects, if taken with out full knowledge of the human system, they can cause serious damage, even death. Further, some require a doctor’s prescription to take. Some might get the idea to use the prescription med of a friend. Again, this is unwise and dangerous. They are prescribed for a reason. So as with everything we do, we need to use discernment and be balanced in our choices. What are the remedies for managing minor stresses to all out public speaking anxiety? They fall into six different categories. In addition to public speaking anxiety, a closely related matter is sleep and rest. Getting enough before a speech might be a problem for some. Due to its relationship to the subject as well as to the misinformation, it will be included in this section. A note from the site owner. It cannot be stressed enough, you should only use many of these under the supervision of a trained medical professional such as a doctor or nurse practitioner if their license allows for such care. This is not just being said for liability reasons. I am speaking as a nurse who does use holistic medicine when appropriate and when necessary traditional medicine. It is having seen people damage their health and lives by the uninformed use of many preparations available that causes me deep concern. The examples you read above were from my personal experience. It is because of this experience this site does not endorse and strongly recommend you avoid the ones with dangerous side effects. If we list some, it is because they are already commonly known and used. Others we are aware of that are not common you will not hear about. It is my hope and desire for all visitors to advance in their careers to speech mastery. Please face your challenges to get there in safe and ethical ways. These are the six modalities of Stress Reduction available to speakers. If you know more, please send them in so we can add to our list. These alone or in combination will have varying affects. This is because of how we are uniquely made and also because of the power of the mind. If you believe something will work, it will work. It’s called the placebo effect. We will continue contributing to this section. If you hear of or know other means of dealing with public speaking anxiety for experienced speakers, please contact us thorough the suggestions page. In addition to stress management, there is health maintenance. We have tried, tested or reviewed many of the natural remedies for anxiety. The best is the simplest and is almost free. It is probably in your cupboard right now.